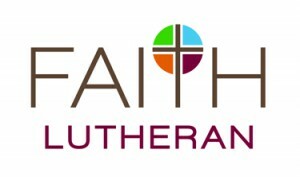 Following the Spirit Discernment Series is Back! Register Today…. Thinking about your career? Wondering how God is calling you in this new year? Contemplating your greatest gifts and passions? Longing to make a move? 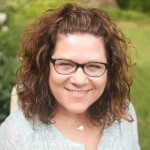 Unpacking a season of change, struggle, or suffering? Or simply desiring quiet in a community to be still with the concept of vocation? Join us for this series. 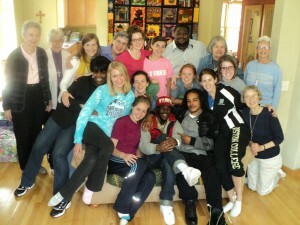 A small group at St. Jane House. 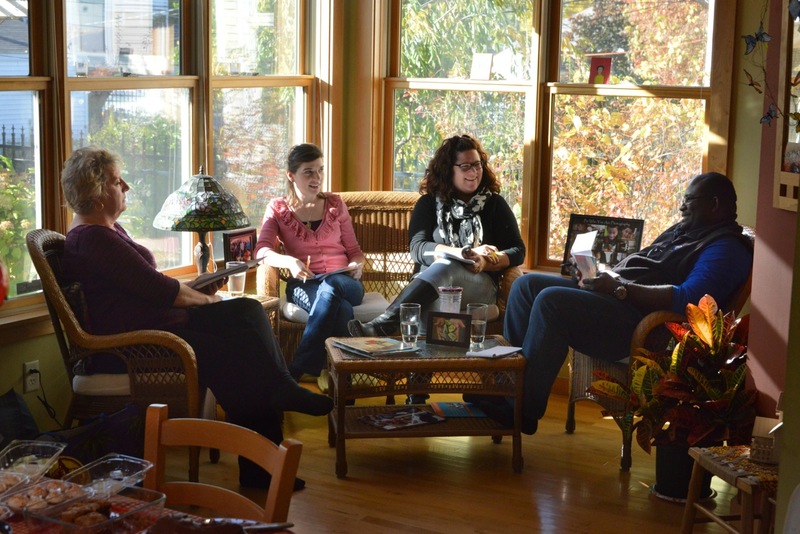 Anchored in the rich tradition of discernment resources, each session will offer a different form of prayer, feature a vocation story, and include time in small groups to unpack participants’ discernment journeys, focusing on vocation. Attendance at all five discernment evenings is strongly encouraged. The Visitation Community is happy to partner with the Collegeville Institute for Ecumenical and Cultural Research using their adapted curriculum material for the series. 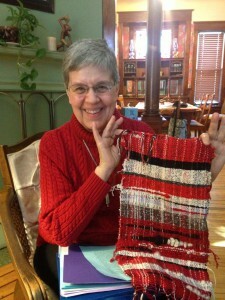 Weaving as Metaphor: S. Mary Frances shares a tapestry made by Mary Johnson at the SAORI Weaving Studio. Through the slanted wood shades of the Girard House living room windows, morning light fell on the red, black, and white cotton and silk fibers woven together by our friend Mary Johnson. 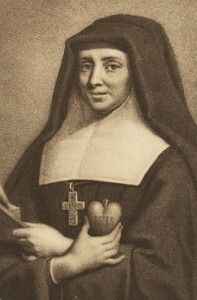 Quoting from the Companion to the Rule of Life of the Visitation Order, Sister traced her fingers along the color lines and weaving pattern, illustrating her metaphorical point. According to wikipedia, woof and weft derive from the Old English word “wefan” which means “to weave.” Warp is the lengthwise or longitudinal thread in a roll, while woof is the transverse thread. The warp and the woof ultimately form a fabric. Figuratively, then these Salesian virtues of humility and gentleness, woven together become the fabric of love for our lives. Can you imagine how humility and gentleness are threaded through love? 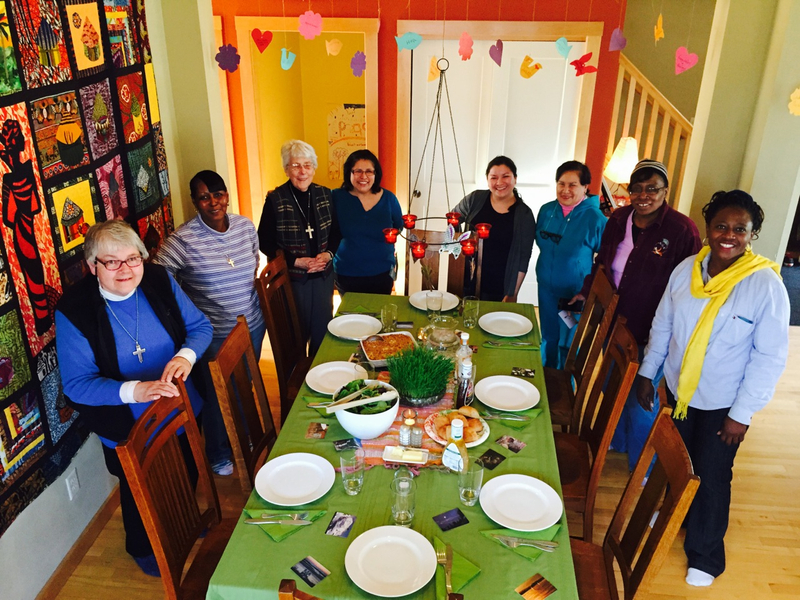 Can you see the sisters in their urban monastery, “living Jesus” as consciously as possible: stitching together experiences at the door with neighbors in need or want of prayer – a meal, a bus token, warmth – all drawing on Christ’s love? Can you count the ways you practice living in such a manner — checking your ego, releasing anger or hostility in any given moment, and letting these virtuous acts knit you more closely with Love and Creator? 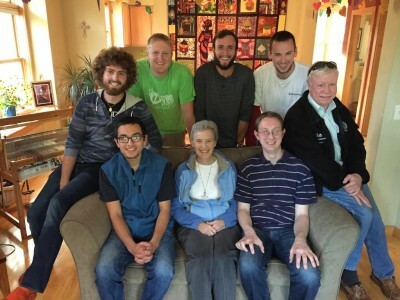 It’s not often that I get to meet one-on-one with Sr. Mary Frances. Convened to discuss themes emerging in our vocations and engagement work, our conversation took us to these Salesian elements that envelop the sisters’ ministry in Minneapolis, and inspire me in my own intentional, contemplative life. Listening to “SMF” I am moved. I am reminded of how our co-founders Sts. Francis de Sales and Jane de Chantal believed we were all called to holiness. The Sisters. Our priests. Our bishops. You. Me. The neighbor. We can all live and practice these virtues that are part of the Rule of Religious life. In my next breath, I imagine this metaphoric cloth of virtue being the cloth in front of me: all red, and black and white perfection and blemish in its unique beauty. I can jump then and fathom the ordinary gray pants and purple sweater I wear as equally made, as intentionally stitched, as that which I don with a full heart and desire to live with integrity. I imagine myself gentle, humble and eeking love as I encounter each member of creation. 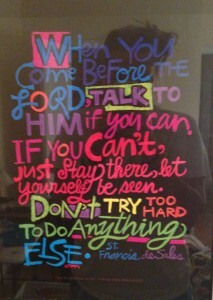 And this conversation, this fabric, becomes my prayer for the day. I invite you to hold this meditation and consider what the warp and woof of your heart is this day. May Love bless and guide us all. 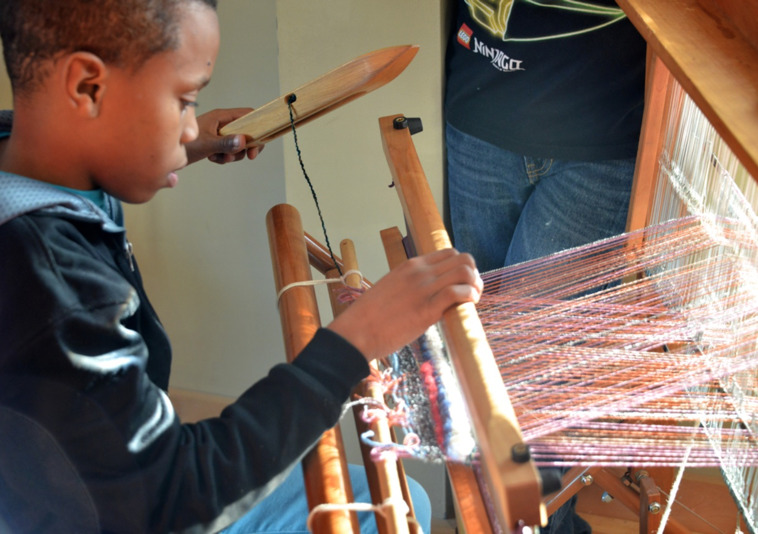 Click here to learn about the Pop Up SAORI Weaving Studio at St. Jane House. 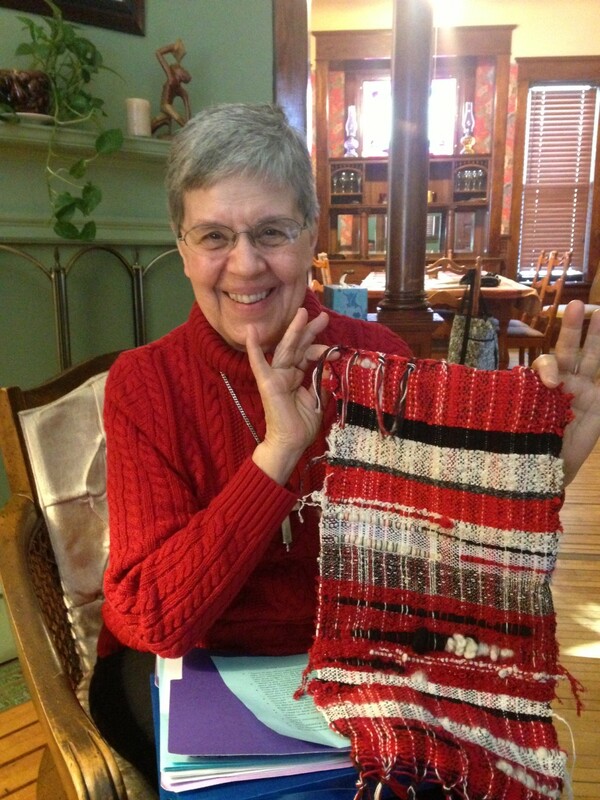 Join us at St. Jane House for this Zen Arts Weaving Meditation experience! 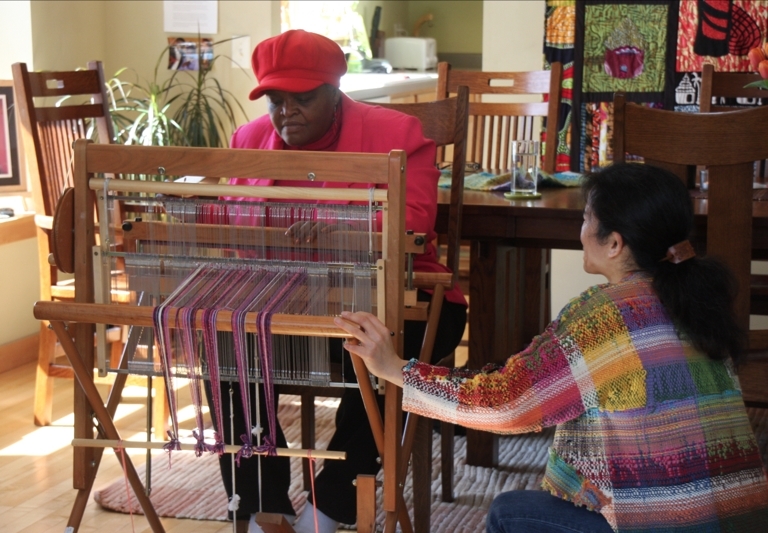 For five days in February, the St. Jane House will become a Pop-Up SAORI Weaving Studio! The fun begins with a special Valentine’s Date Night event on February 14th, and includes a Zen meditation retreat as well as opportunities for parents and children to create unique works of art together. Certified SAORI weavers Chiaki and Dan O’Brien will lead sessions in this contemporary Japanese style of weaving that celebrates self-expression, sees beauty in “imperfection”, facilitates healing, and reveals the uniqueness and dignity of each person. Nine looms and a variety of threads and textures will be made available. If you wish, you are invited to bring your own materials as well to incorporate into your creation: cut up strips of worn clothing/fabrics, unraveled yarn, heirloom jewelry, shells, twigs…anything you might like to work into your piece to make it your own. All workshops and retreats are donation-based, “pay what you can” (with exception of the Valentine’s Day fundraising event). 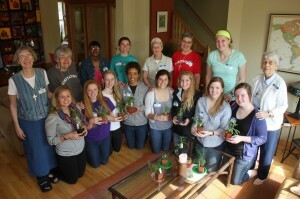 A portion of the proceeds from all sessions will support the acquisition of a SAORI loom for the St. Jane House. Space is limited. Click to learn about each of the 9 sessions being offered and to register. If you are unable to attend any of these events, but would like to contribute to the cause, a tax-deductible donation can be made to help acquire a loom for the St. Jane House. As an expression of our gratitude, those who contribute $50 or more will have an opportunity to enjoy a personal weaving retreat at the St. Jane House during 2014. Check out photos and get updates on Facebook event page. The popular Zen Box Izakaya Pub and Kitchen is teaming up with the St. Jane House and SAORI Studio Fun to create the “Share the Love” Valentine’s Date Night Event on February 14, 2014, from 6pm – 9:30pm. Enjoy drinks and a candle-lit dinner for two, complements of this local Asian restaurant, followed by a 2-hour couples weaving session with certified SAORI weavers Chiaki & Dan O’Brien. 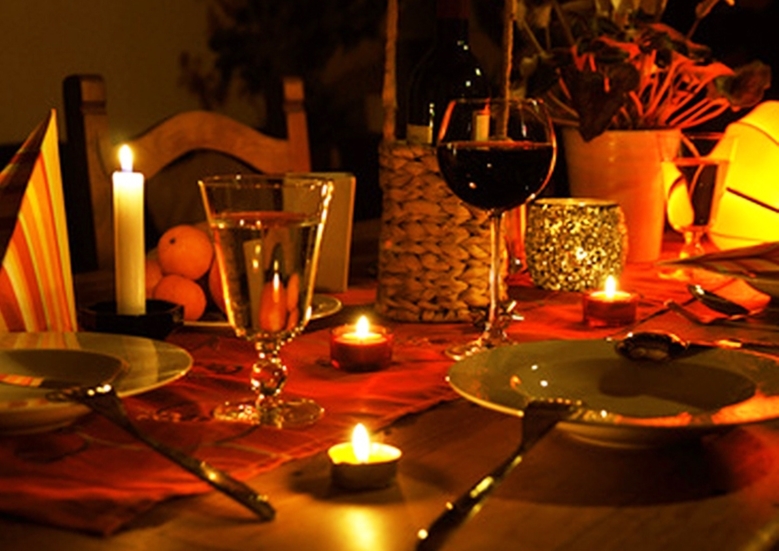 Leave with a beautiful work of art you and your sweetheart create together. Wine, beer and other beverages included. $125 donation per couple. 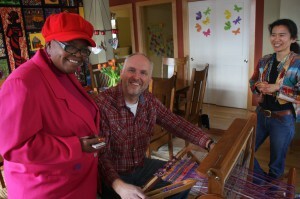 The proceeds from this fundraising event will help acquire a SAORI loom for the St. Jane House. Space is limited. RSVP today. Certified SAORI instructor and meditation teacher Dan O’Brien will lead this retreat that incorporates weaving with awareness, as well as breaks for meditation and discussion. People of all spiritual traditions will find this a welcoming, ecumenical experience. Lunch provided. Participants will create a unique piece of woven art. In the Zen tradition, people donate based on their means. Space is limited. Reserve your spot today. St. Jane House, 1403 Emerson Ave. N. MinneapolisEnjoy three hours of “weaving with a happy heart” with SAORI instructor Chiaki O’Brien. In this free-style form of weaving, there are no mistakes and beauty is seen in imperfection. Participants will create a unique piece of woven art that is an expression of their deepest self.Light snacks and beverages provided. OptionalCentering Prayer session at 8am precedes Tuesday morning workshop. Space is limited.Reserve your spot today. These two special sessions on President’s Day provide an opportunity for parents and their children to weave together a variety of colors, threads and textures to create a unique piece of art that will become a family keepsake. Consider bringing meaningful textiles, fabrics, jewelry, etc. from your family’s history to incorporate into your creation. Also open to mentors and the young people in their lives. Space is limited. Sign up today. Heidi’s dad died this week. 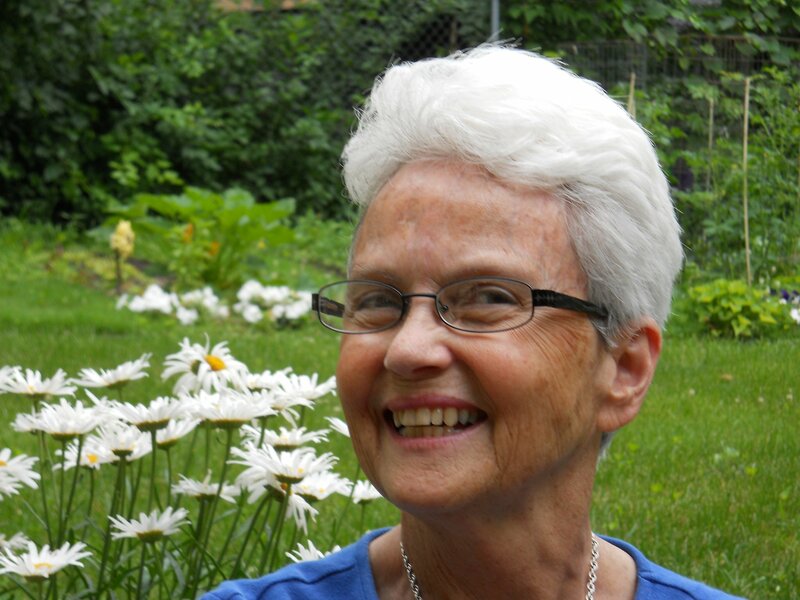 Margaret lost her daughter to a long battle with cancer. 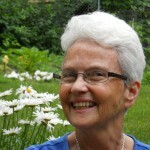 Karen endures chemo, fighting a malignancy in her breast. Serena showed up at our door, seeking cold-weather clothing. Our local priests and church leaders continue to discern a course of leadership and healing in the face of more sexual abuse accusations. Khalilah recalls the passing of her mother; and Francois and I hold the memory of our son who lived for one hour. These struggles or sadnesses all inform our prayers this week. As humans, we suffer. We wonder; we ache; we seek understanding in the face of our illnesses and all that we endure. And we lean into a loving God to show us the way. 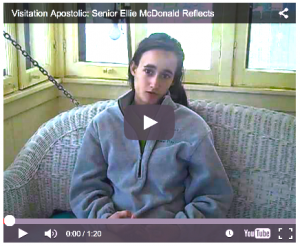 What is the role of prayer or meditation in easing our suffering? How does leaning into the holy, the divine, the mysteries of this universe and our alignment with all of creation, help us transform our ills, and make a way through our seasons of struggle? He said all this quite openly. And Peter took him aside and began to rebuke him. In session four of our “Following the Spirit” discernment series, we focus on the role of suffering in our vocations. As we prepare for this course, we consider different “tools” for helping our discerners navigate difficulty and find a way to hear God’s voice in their present circumstances and their larger life callings. 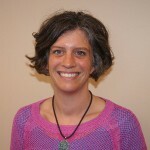 Tonglen meditation is one tool we draw on to teach the transformation of struggle and suffering. In this Buddhist-meditation practice, we find the intersecting Christian teachings of compassion and forgiveness and the Salesian virtue of gentleness. In the process of this practice, we may experience deep consolation and healing.We invite you to try it. Find a comfortable posture, palms up, eyes closed, feet on the ground. This work takes great courage. Trust your ability to do it, as you align with your heart’s deepest wells of love and the mercy and kindness you possess. 1) Identify a source of suffering or struggle within your own life. How have you experienced hurt? Fear? Resistance? Doubt? Shame? Breathe in the experience, imagining it as hot, heavy air or smoke, including the feelings that accompany your hurt. Let them touch every part of your being. Exhale loving kindness and mercy. Imagine this as light, loving air. 2) Consider the suffering or hurt of a beloved friend or family member. Breathe in their pain, recognizing you are not alone in your struggle. See how they hurt in their circumstances and invite the mercy and kindness of your heart to transform this woe. Exhale loving kindness. 3) Recognize the hurt or pain in an acquaintance – someone you see on the street, driving in a car, in your place of work, or at the gym or grocery store. Breathe in their pain, and exhale loving kindness. 4) See your would-be enemy, and envision how they hurt. Let their struggle enter your imagination, and trust your heart’s ability to be softened and hold their pain. Inhale deeply and exhale loving kindness and mercy. 5) Consider your pain, that of your beloved, what ails the acquaintance or stranger, and that of your would-be enemy as one: inhale the collective hurt of all and exhale loving-kindness. Recognize how connected all suffering is, and your power to send love and light, joy and kindness to all. I hyper-extended my knee during prayer this past week. The experience has left me wanting, wondering, and takes me to the center of my reflections on what it means to pray well. I was off to a rocky start Tuesday morning. Was I running late? Was I anxious about the flow of the morning? Concerned about my responsibilities in attending to – or providing for- some festive, post-prayer-party atmosphere? Who knows. I just know I was a bit off in my rhythms. 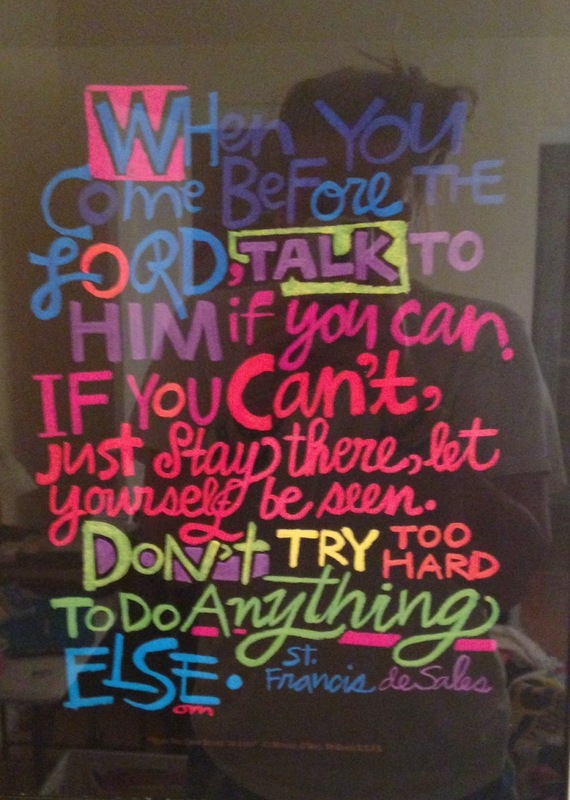 We were celebrating five years of Centering Prayer at St. Jane House on Tuesday, along with Director Brian Mogren’s recent Human Services Award. It was a party — a joyous occasion. I wore a short skirt, and taking my place in the circle of 17 or so other festive-centering-prayer warriors, I all of a sudden got self-conscious. More easily thought and said than done. 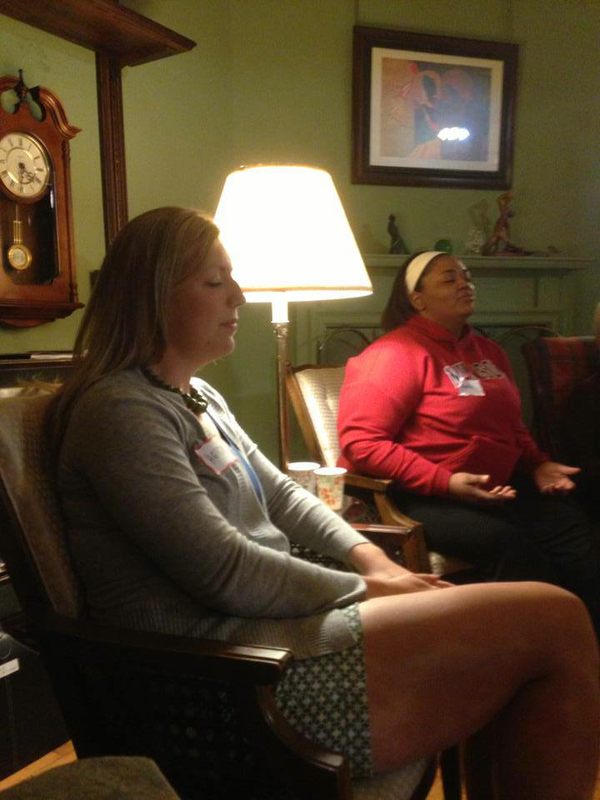 When we pray at Centering Prayer, there’s a universal invitation to position yourself in an open stance. You take a seat. You relax. You soften your gaze. You open your palms and plant your feet firmly on the ground. You take a deep breathe. You let Love pour through you in each inhale and exhale. You take up your sacred word and let this guide you in clearing your mind completely, and letting God have all your thoughts. If you are in a really blissed-out place, or lucky, you have more than 3 seconds of an awareness that Love permeates all things and is the author of all that is good and true and is in charge in this world. You are forgiven and held and know compassion and calm. But if you cross your legs, and hyper-extend your knee during centering prayer, this bliss is not easily yours. Sometimes, I think this sort of hyper-extension is true for all of us. We are simply working too hard at prayer; we are getting too self-conscious of what may be exposed; we are afraid to be truly vulnerable with God. And so we protect ourselves. We cross our legs, so to speak, and avoid all openness with our Creator. My point is: How do you pray? What is your prayer life like these days? Where do you find yourself in the art of relaxing, giving yourself over to the divine, offering up words of thanks or request or praise? Or simply showing up, presenting your heart to God?